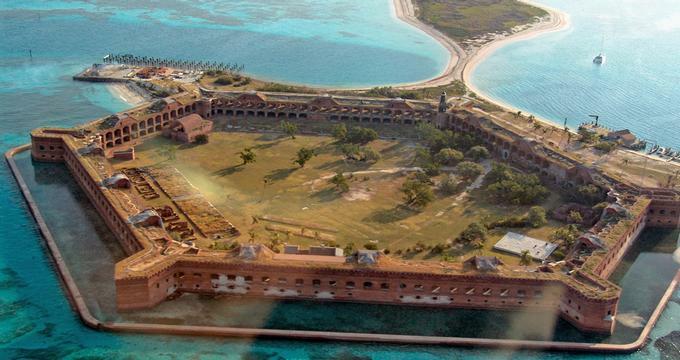 Blending history with undisturbed natural artifacts, Dry Tortugas is like a little sacred place that was discovered by colonialists who had the foresight not to interfere with the area’s ecosystem. In 1976, it was ratified as part of the Everglades and Dry Tortugas Biosphere Reserve, which falls under the guardianship of UNESCO. Tortugas means “Turtles” and “Dry” refers to the fact that there is no fresh water on these islands, and this we know from the diaries of 16th century European explorer Juan Ponce de León, who documented that he caught some 160 turtles here when he landed here in 1513. In 1971 one of Dry Tortugas’s most famous shipwrecks was discovered off the coast of Loggerhead Key, one of the park’s islands. The vessel was only identified in 1990 as a Norwegian vessel which had sunk in the area in 1907 – the reasons for the wreckage are still not known today. There are still parts of it down there, which you can explore when you dive in the area. 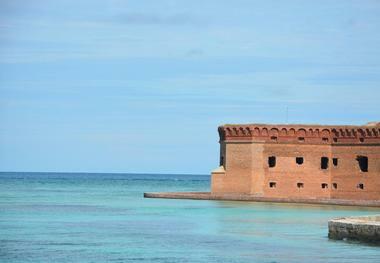 Fort Jefferson took nearly 30 years in the 19th century to be built, and in all its hexagonal glory, it is still not finished. When you visit, you will be enthralled by the series of arches and the beautiful brickwork that constitutes this fascinating construction which was designed to protect the harbor, which was at the time one of America’s most important deep water gulfs, and it was also there to assist ships that were seeking refuge from storms or in need of restocking or refitting. If you look at Fort Jefferson from the air, it looks like it is emerging magically from the sea, because it takes up all the available ground on the island of Garden Key. And the lighthouse on Loggerhead Key, built in the 1820s, also has some curious tales to tell. Soon after it was built, it was discovered to have a design flaw, in that one of its doors obscured its visibility to passing ships. While this was addressed over the years, it has been a problematic lighthouse, for technical reasons, which may well explain why the Dry Tortugas National Park is a repository for shipwrecks and the kind of ghost stories that revolve around such histories. And speaking of the spoils of shipwrecks, you can see a lot of the things that have been found deep under the sea, such as cannons, anchors and the like, in the South Florida Collections Management Center. These objects were retrieved from wreckages by the Submerged Cultural Resources Unit, which conducts specialist deep sea archaeological research. Indeed, there is a carefully plotted Research National Area around Dry Tortugas’s perimeter, in which the ecological integrity of the area is being explored, together with its possibilities for self-renewal. The area was first recognized for its heritage potential by President Roosevelt in 1935, when he made it a monument under the Antiquities Act. But reaching much deeper into the area’s history, it is estimated that the archipelago was initially formed some 200 million years ago. The islands are considered as accumulated sediment on the Florida Platform, which is based on carbonate rocks and dolomite, as well as limestone, within which the pristine coral formations have been preserved. The sea around this ancient area is more than 10,000 feet deep. 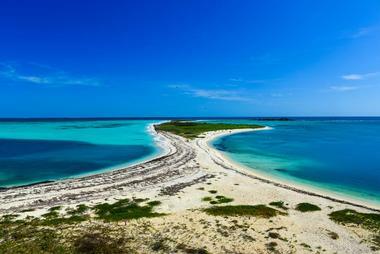 The three main islands in Dry Tortugas National Park are Garden Key, Loggerhead Key and Bush Key. The other islands, which are considerably more hostile to human visitors, are Hospital Key, Middle Key and East Key. Garden Key has had the most human impact and also the location of the information desk and resource center for the park. While each island has glorious beaches, take care to adhere to the swimming rules, bearing in mind that certain areas aren’t suitable for swimming due to the force of the sea. There are many things to do in this area, including night sky watching, snorkeling and diving, as well as ranger-guided tours and paddlesports. Located 3 miles from Garden Key is Loggerhead Key, distinguished by its lighthouse. It’s named thus because of the many loggerhead turtles which frequent the island. You can only visit Loggerhead Key during the day. There are guided hikes and tours available, but no camping site. Bush Key is the place where two types of bird, sooty kerns and brown noddies make nests in masses between February and September of each year. For this reason, the island is completely closed to human visitors during this time. When you do visit it, however, make sure that you carefully adhere to the trails, to ensure that you don’t disrupt any natural life there. And named for the island are the sea turtles themselves, which make them, part of the Dry Tortugas experience, if not the main attraction. Five distinct species of sea turtles – the loggerhead, the green turtle, the leatherback, Kemp’s ridley and the hawksbill, nest and breed in the area annually, but several of them are today, sadly, endangered species. And if swimming and looking at wild life on a beautiful Edenic piece of nature is not your thing, Geocaching might be. It’s the world’s largest treasure hunt game, devised with GPS and cell phone technology to get people exploring this world, giving back to it, and discovering new things about it. 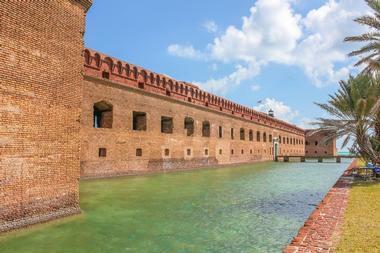 The Dry Tortugas National Park has Geocaching sites for your pleasure. But remember that 99% of this national park is water, so if you’re not a water baby, you might lose out on seeing some amazing sites, including the ship wrecks under the sea, the astonishing living coral heads and historical Coaling Pier Pilings from the 1800s, among other things. Since 2000, the park has averaged less than 70,000 annual visitors and this might have to do with it being a cherished secret some 70 miles from Key West, or with the fact that you cannot just arrive there. A visit to Dry Tortugas National Park needs careful planning and packing and if you’re not early, you might not be allowed on. The number of people allowed on the islands at any one time is strictly limited to 68, and it’s strictly on a first come, first served basis. There is only one campsite on the archipelago, it can house up to twenty campers at a time, and it is situated at the island called Garden Key, which is where Fort Jefferson is located. To visit, you need to pay an entrance fee which is a nominal $10 per camper. It’s a “pack in pack out” area, which means you must take away everything, including your refuse, back with you. All you can leave are your footprints. And while it is a primitive camping experience, with many restrictions, and rules, including the fact that you need to bring with your own drinking water and need to provide about 2 gallons per person per day, and the fact that you cannot make a wood fire and cannot bring fuel onto the islands, it is an unbelievably beautiful place to be. While neither spearfishing nor lobster fishing is allowed in the park, in certain areas, you may fish, but please check all the regulations before doing so. Given the litany of research, the preservation ethos and the understanding of the potential extinction of some species of fish, you don’t want to muddle with ecological balances. The National Park’s compost toilets do not work between 10am and 3pm (you can use the ferry’s facilities during this time), and campers are asked to honor the request for quiet time between 10pm and 6am in the park. Out of respect for the environment, it’s a good idea to leave electronic sound equipment at home. Weather is always an important consideration when you are visiting an island, and this is no small matter when it comes to Dry Tortugas. The weather, similar to the sighting of American crocodiles in the terrain, is unpredictable, and it is described as borderline subtropical, but you need to take careful precautions particularly when it comes to wind, which can be quite severe.